We have distilled our decades of research and practice into four key steps. Interested in improving your strategic sales, marketing and key account management? Contact us for more information. Mapping the market: Markets are changing rapidly. It is essential to understand how goods and services flow from the originator to the final consumer and more importantly, who the key decision-makers are. 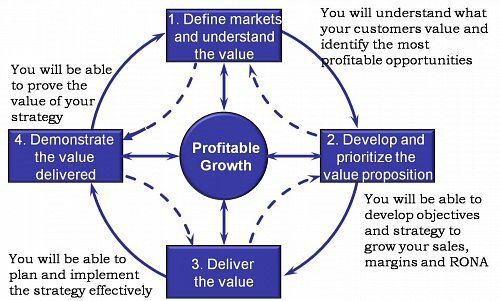 This entails defining your market and understanding what value means. Segmenting at key decision points: Correct needs-based segmentation is the bedrock of commercial success. This is NOT socio-economics, demographics, geodemographics, or psychographics. It consists of splitting an actual market into groups of people who behave in a similar way. It is best done on the key decision points on the market map (see Mapping the market above). It is most effectively done by using the methodology spelled out in the book by Malcolm McDonald and Ian Dunbar, ‘Market Segmentation: How to do it, how to profit from it.’ (Wiley, 2012). If you want to know more, read this article by Professor McDonald and try this very quick and simple segmentation method. Understanding customer needs: The best way of understanding the needs of people in each segment is by carrying out a SWOT analysis on each. However, this is NOT the usual 4 box pointless matrix. Doing a proper SWOT analysis entails careful and detailed analysis on each segment identified from the segmentation work done above (see Proper SWOT). If you wish to use a simpler method, try the Simple SWOT. Do this after Step 1: The insights about the customer from the previous step should now be turned into financially quantifiable value propositions. Prioritization of segments: The segments arising from Step 1 need to be prioritized in terms of the potential of each segment to grow the organization’s profits over the planning period (usually 3 years). We call this market segment attractiveness. To do this, they need to be placed on a vertical axis scaled from 0 to 10 and labelled ‘market segment attractiveness.’ Each market segment also needs to be placed along a horizontal axis, also scaled from 0 to 10, and according to your organization’s relative competitive strengths. You should already have quantified this from your SWOT analysis in Step 1. Place these in a four box matrix with the size of each circle being proportional to the market size (potential) of each segment. For further advice on how to do this see here. Develop objectives and strategies: You can now set your marketing objectives and strategies. Marketing objectives are the volumes and values you need over the planning period (usually 3 years). The strategies will be how you intend to improve your competitive position in each segment by changing the marketing mix (product, price, place/channels), promotion). Of course, these will need to be costed out in order for the correct budget to be set. By improving the mix, your position will either not deteriorate or, better, will improve relative to the competition. The components of a value proposition: According to McKinsey, 70-80% of companies talk about value propositions but only about 5% have them. There are four components of a value proposition: functional (e.g. improving productivity), reducing cost, avoiding cost and emotional (e.g. improved trust and reliability). The first three can and should be quantified financially to demonstrate to demonstrate to the customer that the offer creates advantage as opposed to merely avoiding disadvantage. An example of a generic value proposition for a components engineering company is available here. Produce the strategic marketing plan: The strategic marketing plan can now be produced. Click here for more information about what this should look like. Implement the marketing plan: Billions of dollars are wasted from marketing plans that fail to get implemented fully. Indeed, implementing a marketing plan is one of the most perilous journeys a marketer will undertake. The risks around implementation are high and the challenges are many. To help overcome them, good marketing leaders need new knowledge, skills and tools. Marketing Navigation by Bradford, Erickson and McDonald, draws upon recent research and years of real experience to help provide a practical guide to navigating the implementation challenges successfully. For a paper on marketing metrics click here.